As a skin care professional, one of my professional obligations is to maintain the appearance of my own skin. So, over the years, I have tried a myriad of lotions, potions, creams, and assorted tools all in efforts of finding a handful of the best products to provide to guests in my skin care studio. I have sought effective answers to skin care concerns – within an affordable price range. And so my story begins about the quite simple, but beautifully effective – silk pillowcase. A few months ago, I began to notice very thin horizontal lines under my eyes. I have been blessed with having very few signs of visible aging, so seeing these little lines was no minor matter for me. As I approach 40, I only ponder what these lines will look like in another 10 years. I use all the best cleansers, moisturizers, serums and eye creams. Yet, these particular lines seemed to be forming despite my doing everything “right” in my own skin care routine. That’s when it occurred to me that it isn’t the products failing. It’s how I sleep. I am a tummy or side sleeper. I’ve tried the back thing; it just doesn’t work for me. I’m one of those crazies who sleeps with my face smashed in a pillow, and I really don’t have a lot of desire to disrupt my cozy sleeping position. Though, I have tried – all in the name of beauty – I still find myself, face smashed into the pillow upon waking. But what does that have to do with those (currently) barely visible horizontal lines under my eyes? Everything! You see, when we sleep on our stomachs or sides, the pressure on our faces is pushing our cheeks up – this creates what I call a “crinkle” in the skin while we sleep. That crinkle is temporary, and goes away after we’re awake… for years. But one day… out from nowhere… we look into the mirror and that darned crinkle has actually begun to be a more permanent wrinkle. Well, we’ll call it a line. But lines become wrinkles later on. And although we may be armed with the most amazing peptide-rich cream, or be getting the most stellar professional skin care services in town – all that squishing up of our facial skin all night long can’t be completely corrected by products or treatments. It’s a sad fact, but as an honest esthetician – I have to tell you we are not superheros. There are some things we can’t fix. Tummy-sleeper-eye-line-syndrome is one of them. I can plump that line, I can smooth it, I can even strengthen the tissues around it – but as long as that “crinkle” is being formed all night long, a line will eventually result (and worsen with time). After becoming quite disgusted with my crinkles, I began searching all around for solutions. From how to sleep differently, to very bizarre pillows that keep your head at a very bizarre position, to pillowcases, to tape – I researched a ton. The bizarre pillow was several hundred dollars. Sorry, but if I’m investing a few hundred bucks into my bedroom – it won’t be for a pillow. As noted previously, I tried the sleeping on my back thing. Not happening. Then the tape… affordable solution, but strange feeling, and I can’t quite guarantee that leaving tape on my skin all night long wouldn’t eventually lead to some entirely different issue. So, the final test was a silk pillowcase. Now, I don’t mean a satin pillowcase. I don’t mean a faux silk pillowcase. I don’t mean some synthetic silk-esque pillowcase. I mean a bonafide silk pillow case. I will give specifics a little later. A silk pillowcase isn’t going to stop you from smashing your face in your pillow. But, it will reduce the tension and friction on your facial skin overnight. 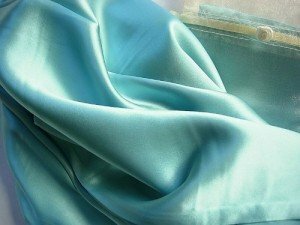 Because silk doesn’t wrinkle in the same way cotton does, or tug the same way other fabrics do, when your face is pressed against silk – you have less impressions left behind on the skin, and less pulling of the skin due to reduced friction between the skin and the surface of the pillow. I was happy to have less crinkly-impact on my skin overnight, but then I discovered a whole benefit I didn’t know existed! By about day 3 of using my fabulous new silk pillowcase, I noticed something rather remarkable when I washed my face… My skin felt completely different under my finger tips. Maybe you don’t pay attention when you cleanse your skin, and that’s totally okay! But, I do. So when I could tell the texture of my skin felt notably more smooth as I cleansed, I began some further research on what may have caused this, as the pillowcase was the only change to my routine. What I learned is that silk does not absorb moisture like cotton does. Why does that matter? Well, I’m sure you’ve heard or read somewhere to wear cotton socks and undies. Ever wonder why? It’s because cotton is super absorbent! It literally wicks away moisture from other surfaces. This is why we use cotton bath towels; think about it! Silk, however, doesn’t do this. When sleeping against cotton, we’re exposing our skin to a substance that is quite effectively pulling moisture away from us all night long. Not a huge deal really – unless you’re speaking from an anti-aging standpoint. Moisture is critical to beautiful, healthy, youthful looking skin, so just a few days of my face resting on silk instead of cotton – and I was hooked. Another added benefit is that due to its slippery surface, silk also keeps your hair in better shape. Silk pillowcases cause less hair breakage, again due to reduced friction and tension. I have also noticed a look somewhat less like Medusa in the mornings. My hair is notorious for looking CRAZY when I wake up – something in the silk has at least reduced that to semi-Medusa status. Some ladies actually use silk scarves to wrap their hair at night, but since skin is my focus – I’m just not dedicated enough to do the hair wrap at night. Feel free to try it yourself if you’d like. Silk pillowcases are fine for oily skin as well. Some people do have an allergy to an enzyme in silk. But, I don’t care what substance it is – someone will be allergic to it. It’s the times we’re in. Rest assured, silk is a natural and safe substance and unless you DO have an allergy to it, it’s fine. Promise. Don’t get cheapy knock-off pillowcases from who knows where made from who knows what. Shoot for 19 or higher momme charmeuse silk when possible. Momme is simply a measurement for the quality of silk. Care for your silk according to manufacturers directions. I have come to the professional conclusion that everyone should have a silk pillowcase! I absolutely adore mine, and it not only feels amazing to the skin, it has a very functional purpose: assisting the skin in staying hydrated and crinkle-free. Or, at least crinkle-reduction. Nothing is magic, but silk is pretty close! loved this article! I am off to find a great silk pillowcase. Thanks, Liz! You’ll love it!!! It’s really something just short of amazing isn’t it? I’ve seen so many people, myself, my mother, grandmother, etc start sleeping on silk and report this same stuff about the benefits. Yes, it is! Silk is a game changer! Would love information on your silks! i really enjoyed my ultrasonic facial last week, and as a fellow tummy sleeper, I am off to find a silk pillowcase! Thank you, Crystal! It was great to see you. You’re going to love having a silk pillowcase. I have one I take with me when I travel now, lol!!! Hi Casey, I’m grateful for your advice about getting or using a bonafide silk pillowcase. I found it interesting when you said that silk is not absorbing the moisture of our face like the cotton does. My mom will be happy to know this most especially if I am going to buy a pair of silk pillowcase for her. Cheers and more power! Thank you, Joy. Yes, silk pillowcases are the best. I find that once someone has begun sleeping on them, they’ll never like cotton pillowcases again!